The British Gazette » We agree with Chris!!!!!!!!!!!!!!!!!!!!!!!!!!!!!!!! 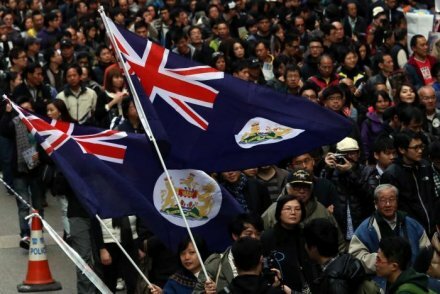 Above, a photograph of pro-democracy protesters waving Hong Kong colonial flags during a rally on New Year’s day in Hong Kong on New Year’s Day 2013. The protesters in Hong Kong have accepted an offer of talks with the Hong Kong government. Chief Executive CY Leung. Leung offered the talks with his deputy late on Thursday but rejected calls to resign. British Gazette comment: We agree. A crucial aspect of any negotiation is the ability to realise how far you can push the other side into making concessions. A failure to realise that your opponent has reached that point will invariably result in the opponent digging in and eventually you will end up with much less than you would have got. In other words, quit while you are ahead. As we stated in our article yesterday, the best the protesters can hope for is that a broad spread of independent minded candidates are put forward to the Chinese authorities to vet and they acquiesce. What is vital – and the protesters must know this as they are Chinese – is that the Chinese authorities cannot be seen to loose face.